Woo hoo, says Beel! A big fish brought to justice. Field and Stream (and other sources) report that James Bramlett of Dora, Alabama captured this beauty on 28 February 2013. The fish, which weighed in at 70 lb, breaks a longstanding Alabama state record for striped bass (a 55-lb specimen captured in 1959). 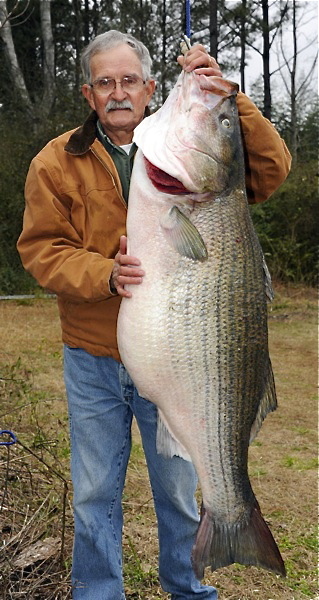 Bramlett’s fish is also larger than the current IGFA all-tackle world record for landlockedstriped bass, which currently is recorded as 67 lbs. 8 ounces. Appropriate paperwork has been submitted to the IGFA for evaluation as a new record fish, but news will not be immediately forthcoming as the IGFA requires three months to render a determination. Bramlett was fishing on the Upper Bankhead, an impoundment of the Black Warrior River in north-central Alabama, and caught the big fish using a 10-inch gizzard shad Dorosoma cepedianum as bait. Bramlett has not yet released the time and place of his upcoming fish fry. 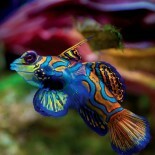 Beel has examined Twitter interest in this fish using Topsy Analytics and TweetChart. Please friends, allow Beel to present the results. These results (above) are quite interesting. Bramlett caught his fish on 28 February and there is an obvious spike in tweets on that date based on a report by RayComm News. However, it took another 5 days for the story to breakout into the mainstream media, at which time tweets about striped bass increased sharply. 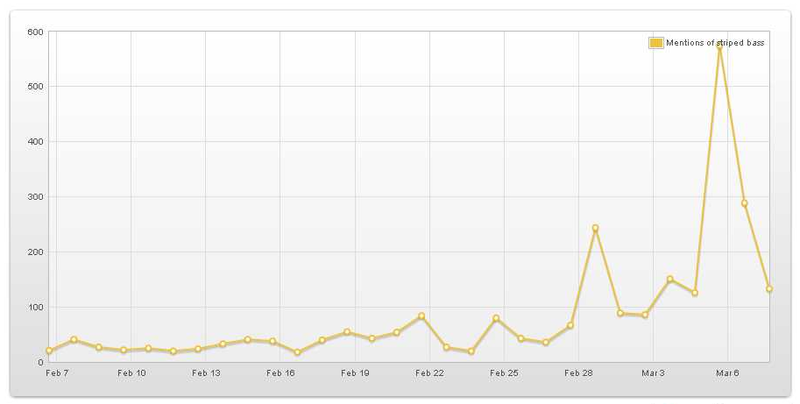 Beel also used TweetChart to examine the nature of tweets over the one-week period 3 March- 9 March 2013 (above). There is a lot of routine information in the graphic, which can better be seen by clicking on it. But please let Beel direct your attention to a couple areas. First, in the extreme lower right is a pie-diagram that reports the “sentiment” of the tweets- over 99% of these were positive. Folks were pleased to report the catch and commented positively. Although there were a few kill joys. Second, and hold on to your hats, in the lower extreme right, the diagram shows that most tweets were sent out by men! Neat stuff. Enjoy, says Beel! This entry was posted on March 9, 2013 by denstormer in Fishing and angling and tagged queryomics, Topsy Analytics, trophy fish, Twitter.